Engineers at Orbital’s Satellite Manufacturing Facility in Gilbert, Ariz. place the satellite on the vibration table. Orbital Sciences Corporation recently completed Electromagnetic Interference/Capability (EMI/EMC) testing and structural dynamics testing of the Landsat Data Continuity Mission (LDCM) satellite. Pictured above, engineers at Orbital’s Satellite Manufacturing Facility in Gilbert, Ariz. place the satellite on the vibration table to perform the side-to-side X-axis vibration test to ensure the spacecraft can survive its rocket ride into space. The satellite is currently being prepared to enter thermal vacuum testing during which the satellite will be operated in a chamber that simulates the vacuum and temperature extremes of space. 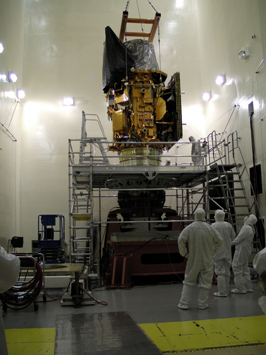 Thermal vacuum testing will take approximately one month to complete. The LDCM satellite is scheduled to be shipped to the launch site at Vandenberg Air Force Base in California in December. Once launched in early 2013, it will be known as Landsat 8 and will continue the rich legacy of previous Landsat satellites that have collected images of the Earth’s global land surface to benefit society in numerous ways including: agriculture and forest monitoring, water resource management, and land use change assessment.